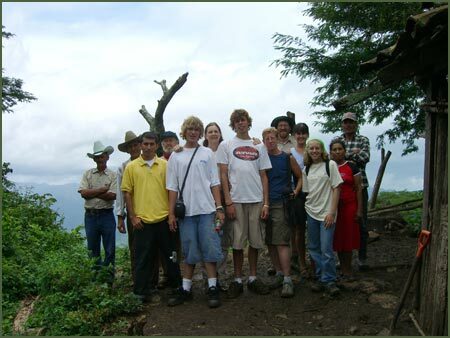 The 2005 Delegation from Casa Baltimore/Limay left Baltimore on July 14th traveling to Dulles airport where they flew to El Salvador and then on to Managua. The group consisted of: Barbara Larcom, the leader of the group, Howard Nash, Carol Berman, Ann Gordon, Nancy McAleer and her 15 year old daughter Julie McAleer, John Grace and his two sons Gabe, 16, and Fred, 19, and Tom Hyatt and his 15 year old daughter Molly. Marilyn Carlisle came along for the Mangua portion of the trip but did not go to San Juan de Limay this time. The dates of the trip coincided with the Sister Communities Conference in Managua. The group spent two very enlightening days at the conference learning about the work so many individuals and organizations from around the world were doing to support communities and people in Nicaragua. Barbara Larcom was one of the prime orginzers of the conference. The group also had some tourist time visiting the old city of Granada, the (active) Masaya volcano and swimming in the Laguna Apoya. They also attended the celebration of the revolution in the central plaza of Managua where Nancy got to play her flute along with a Nicaraguan group in front of the tens of thousands who were there. Heading off to San Juan de Limay, they lugged the 24 huge bags they had brought to Nicaragua that contained medical and school supplies to the Managua bus station, squeezing the bags and themselves into a small fleet of old taxis. 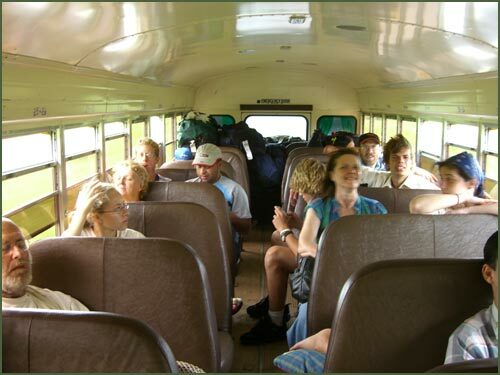 They took the express bus from Managua to Esteli and then continued on to Limay in another old converted school bus along the rutted, dirt and stone road that connects Esteli with Limay. In Limay, they were greeted by the families with whom they would stay while in Limay. 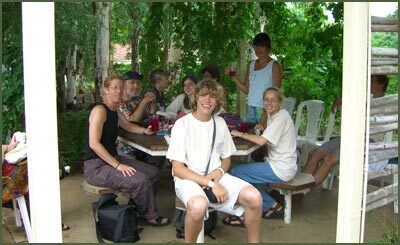 Here is the group (minus Tom who was taking the picture and Julie and Carol who did not make the trip that day) , at El Zapote, a village in the mountains above Limay that the group visited.